As many of you know we have many of our sensors on Federal Aids to Navigation so they are out in the water along the entire coastal USA. In the Gorge our Nav. Aid sensors include Rooster Rock, Stevenson, Viento, Event Site, Dougs, Wall and 3-mile. It took us years of endless paperwork and visits to Washington to get the Defense Department, NOAA etc to understand the importance of coastal and waterway wind data to their mission. These Nav. Aid based sensors are usually much better than sensors located on building etc. along the shoreline. These sensors are expensive for us to maintain since we have to use a boat to install and repair the sensors and they can only be accessed on windless days, with the tide just right and osprays are not nesting. 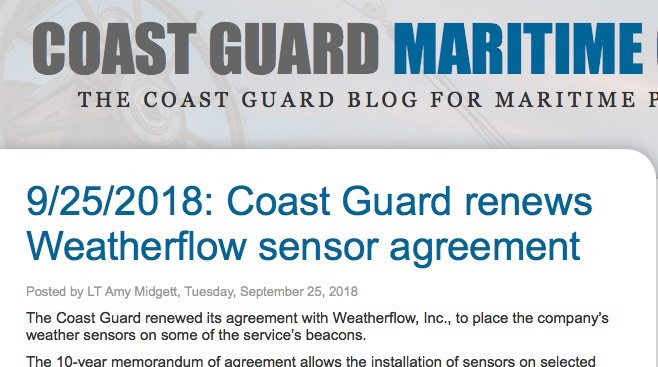 So we are pleased to announce that the Coast Guard has renewed our 10-year agreement for our Nav. Aid based sensors. Without that renewal, we would lose all 141 of our Nav. Aid sensors including the ones above. Below is a link to the bulletin from the Coast Guard. Be sure to wave to these guys the next time you see them on the water! It is so easy to take for granted the service that you provide. I'm sure you've saved me thousands in gas money to say the least. Thank you for the work you put in to bringing it to us. Actually much of the thanks for our Gorge Nav. 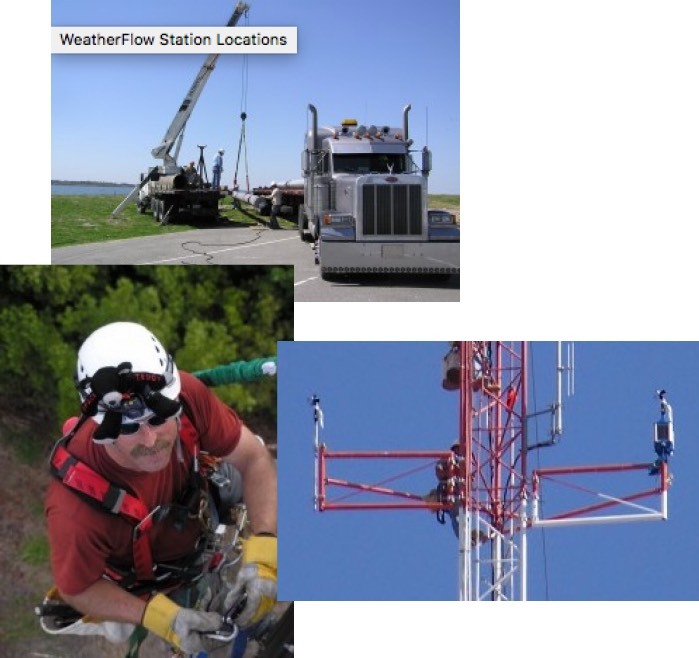 Aid sensors should go to Jay Titlow in our Virginia office who is our liaison with the Defense Department, NOAA and the NWS and spent years getting permission to place our sensors on federal property. And lots of thanks also goes to Stuart, Jeff and Bob who installed 141 Nav. Aid sensors around the country including those in the Gorge. Doing these installs involved fabricating custom stainless steel brackets, masts etc. then flying to the to a region, renting a motel then a van, finding a workboat, making the trip then climbing up an algae barnacle covered nav aid to do a complex electronic installation. I have done a tiny bit of this sensor work. It is tough work! I vividly remember a winter day at the M10 Nav. Aid sensor in the Sherman Island channel when the wind abruptly went from calm to 4.2 winds so the boat could not approach the Nav. Aid in the chop to pick me up from the Nav. Aid. Jumping 10 feet into the murky water from the platform into the river mid-winter without a wetsuit was memorable. And Stuart and Bob do this type of work every day! All I do is act as an advocate for more and better Gorge sensors and to pick out Nav. Aids that will benefit the feds while also providing useful information for windsurfers and kiters. Lastly, while windsurfing and kiting may be a small part of our business we will never forget our roots. And even today the great majority of our employees are passionate participants in those sports! Thanks for all your support and your patience when a sensor somewhere in the USA fails. Thanks for the service you provide and all the work that goes into maintaining the sensors. And thank you for working with government officials, which is not an easy job! Our group of wind lovers here in central Ohio has been trying to get a Weatherflow sensor on our lake for several years. The obstacle is the local office of the U.S Army Corps of Engineers. Weatherflow's Ben Miller has been working hard to ease resistance, and recently may have found an opening by going up the chain of command. I hope that USACE offices read Coast Guard reports.